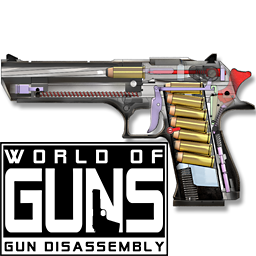 Q.: How to earn credits in World of Guns: Gun Disassembly? Last edited by Stronger on Fri Sep 01, 2017 5:05 pm, edited 1 time in total. It's easy. Best prove that several accounts belong to you - is verified email address. So you have to follow three steps. 1. Subscribe to news digest in the Steam account (important - you'll receive a confirmation email and need to click HTTP address to confirm subscription). In order to do that - click 'Company' in the bottom of the map screen, then 'News' tab on the left. You'll see a big green 'Subscribe' button on the bottom. 3. In the Steam go to Account screen ('Account' button on the bottom of the map screen), press 'Manage Account' button, then press 'Merge Accounts' and follow instructions. Game servers will find all accounts subscribed to the news with your email and the game will offer to merge them. In the end - you'll have a single account for several platforms (all your platforms will be listed on the Account screen). This way you can make one account for several platforms and play where you want. Please note: merging custom skins yet not supported. So if you have a lot of skins created in the Steam account - run Account->Manage->Merge from Steam! Last edited by Stronger on Fri Dec 28, 2018 11:19 am, edited 5 times in total. Q. How to solve that anoying problem: "Could not resolve host"
You need to run the game as administrator. Now it will show where the executable is. It is called "disasm". 6) Select "Run the game as administrator"
Maybe you only have to do this when you installed the game or when it updates. if you get 3.3 or newer you're good (or it's another problem). If you only get 3.0 you need to look at your mesa version. It should at be at least 10.4.X. If it's older you need to update it. There are probably also other methods to get newer mesa drivers which work with other distributions as well. You'll find them .